Almost as soon as I finished my first Practice Deck for Jazz Bass, I wanted to switch gears to writing a general guide to “versatile practice.” Before I do that, I need to first define versatility through an unlikely source – throwback Kanye West music videos. Recently, I was talking with my mom about the contrast between my dad’s working-class Chicago roots and his Ivory Tower achievements. The former, we decided, is all about loyalty (maintaining connection to your original peer group), while the latter is all about royalty (achieving elite status by acquiring more competency than your peers). The problem with loyalty is that you tend to get stuck, which leads to financial insecurity. With royalty, you tend to become socially isolated, which leads to personal insecurity. As I started drafting an outline for a book on versatile practice, I realized that versatility was the happy medium between the two. By practicing establishing connection (to both old and new peers) and developing competency (in various domains), you develop financial and personal security. Below, I’ll illustrate the differences between loyalty, royalty, and versatility by dividing West’s early to mid-career into five stages. 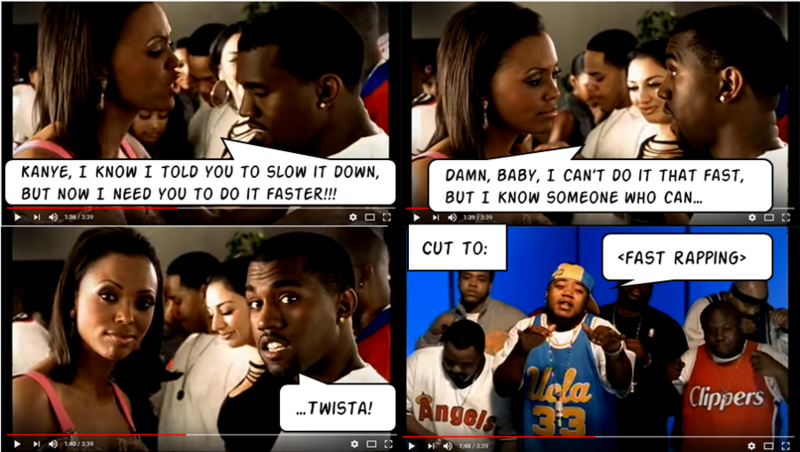 West recorded “Through the Wire” weeks after a near-fatal car accident while his jaw was still wired shut (I joke that it makes his Chicago accent even more pronounced). Facing death made him a more competent artist, because he was more fearless and authentic, which in turn propelled him to royalty (culminating with his initiation into the Roc-A-Fella label). On the other hand, the video emphasizes that he couldn’t have survived his accident without personal connections (to his neighborhood, mother, girlfriend, and icons like Chaka Khan) based in loyalty. “All Falls Down” represents the fragility of versatility and the unfortunate fact that society encourages financial insecurity among Black people and other marginalized groups by promoting mindless consumerism. Even the album, The College Dropout (2004), refers to a more personal form of insecurity. West’s mother, an academician, disapproved of his choice to drop out of college and pursue a career as a musical artist. “Welcome to Heartbreak,” off 808s & Heartbreak (2008) is the lyrical follow-up to “[Welcome to the] Good Life.” The album was a response to the death of West’s mother and the breakup of his long-term relationship. In the song, he grapples with how his relentless pursuit of success (i.e. royalty) has cost him all meaningful relationships (i.e. loyalty). “Heartless” is the visual follow-up to “Good Life.” It shows how even the most luscious, creative world (the product of competency) can turn cold and dark without loving relationships (the product of connection). While West’s career continues to be fraught with insecurity and controversy, My Beautiful Dark Twisted Fantasy (2010) offers a fitting resolution to his versatility Hero’s Quest because it shows the (partial) return of something previously lost – loyalty. “All of the Lights,” in particular, demonstrates connection through the storyline of about a flawed father trying to rescue his daughter from poverty, the mourning of Michael Jackson (an icon of royalty who was referenced or sampled in almost all of the previous songs), and the numerous guest artists (Rihanna, Kid Kudi, and many others listed at the end of the video). While it lacks the security of West’s “Slow Jamz” days, it represents wounded triumph over a trauma much greater than his car accident. While Kanye West has been rightly criticized for a lot of his behavior, I have and will continue to defend him as an artist because his music provided my musician/artist right-brain a roadmap for navigating early adulthood long before my academic left-brain could make sense of it. As a prepare to reinvent myself as a Jazz(ish) Teaching Artist, I want to avoid the traps of musical loyalty (languishing in mediocrity and amateur status) and royalty (trying to gain acceptance in “the club” that will never have me). Instead, I now aim to practice and teach versatility – and finally have the connections and competency to do so. Stay tuned for the e-book guide to Versatile Practice.